Galley Properties are now in receipt of an offer for the sum of £68,000 for 1 Ivanhoe Road, Balby, Doncaster. Anyone wishing to place an offer on this property should contact Galley Properties, 244a Balby Road, Doncaster, telephone 01302 570470 before exchange of contracts. HALLWAY A UPVc door with glazed panel leads into this hallway with stairs that lead to the first floor and doors leading to the kitchen and downstairs WC. A front facing UPVc window provides additional natural light to the stairs. LOUNGE 18′ 6" x 11′ 0" (5.64m x 3.35m) A good sized living room that could comfortably accommodate sofas and a dining table and chairs would make a great family space. With front facing UPVc window and UPVc french doors into an extension that provides another living room. 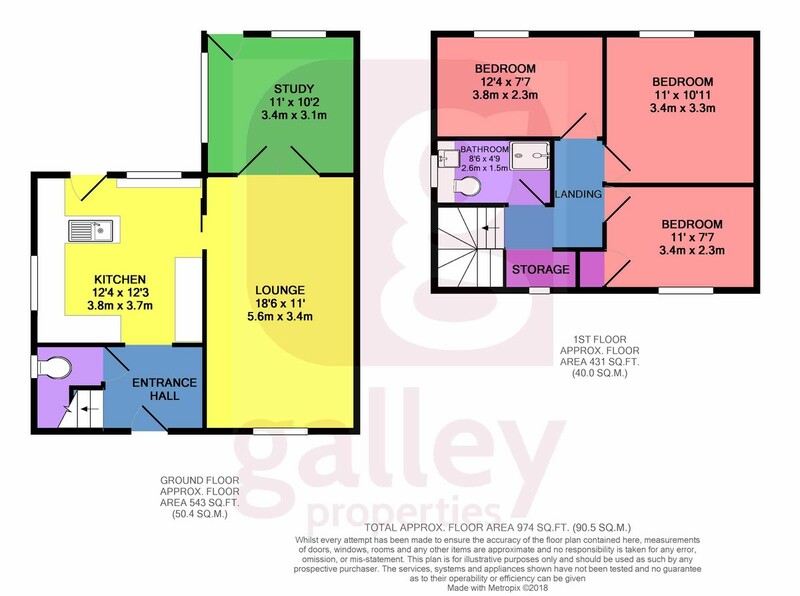 STUDY/ RECEPTION 2 11′ 0" x 10′ 2" (3.35m x 3.1m) A useful room that could be a study, separate dining room or play room with rear and side facing UPVc windows allowing lots of natural light. A UPVc door leads to the garden. SHOWER ROOM 8′ 6" x 4′ 9" (2.59m x 1.45m) A stylish room with a modern feel, featuring vanity unity with wash basin over and low level WC with hidden cistern and shower cubicle. Side facing UPVc window. BEDROOM 1 11′ 0" x 10′ 11" (3.35m x 3.33m) A good sized double bedroom with rear facing UPVc window and pendant light fitting. An enclosed rear garden with wooden panel fencing, laid mainly to lawn with a decking area and hardstanding area.